Health, Home, and Happiness, written by Cara, is a blog about incorporating traditional food, natural remedies, and healthy habits into real life. 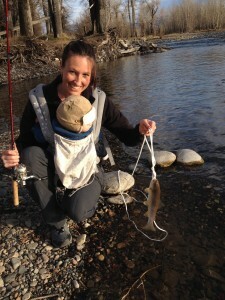 Cara lives in Montana with her three young children. They enjoy the sunshine, swimming, fun day trips (with food packed to bring along!) and hanging out with friends and family. She uses background in the medical industry to help decipher what is nutritional propaganda and what are ‘statistically significant’ studies. She believes that natural, sustainably produced and traditionally prepared food is best for the earth and people alike and enjoys learning more about this all the time. Cara started researching dietary intervention for her daughter 8 years ago, as she was on the autism spectrum at that time and conventional treatments were not helping. The family used the Gut and Psychology Syndrome protocol for 3 years, and still primarily eats a grain-free diet now, though not as strict. Most of the recipes on Health Home and Happiness are GAPS friendly and simple enough to prepare with children underfoot. You can see the recipe index here. As more and more of her friends started having babies and asking Cara about recommendations, she wrote The Empowered Mother– a mother-to-mother guide from a holistic perspective to help prospective parents understand the pros and cons of conventional and natural treatment and preventative tools in pregnancy, childbirth, and the baby’s first few months. Lately, she has been helping families stock their freezer with delicious pre-made main dishes that are Paleo and GAPS-friendly. Click here to learn more about grain-free freezer cooking. You can follow her on Facebook, Pinterest, Twitter, and Instagram. The goal of Health, Home, and Happiness is to encourage the average family that eating real wholesome foods is something that is a priority in our lives and can realistically be done in any family. You’re a breath of fresh air. Thanks for the influence you project. Hello fellow Montanan! I just found your website through Food Renegade. I am looking forward to looking through your pages here. I too am interested in healthy living through healing foods and culturing, ferments and dehydrating, reducing gluten. Glad I found this information and hope to learn lots about local available food sources. I too just found your website and am excited to look through what you have. Awesome to find recipes that are almond and coconut flour based! Both of my daughters and myself are gluten free and have to watch our blood sugar so we will be trying them out! Wow, nice to see someone from MT on here as that is where I grew up!! Excited to check out your blog!! Cara, I heard you on Smart Passive Income this morning on my way to work. Wonderful what you are coins and I came away encouraged and refreshed by your testimony. I could not wait to get home and check out your site. I had never heard of s grain free diet for people which is funny as I share with dog owners about grain free food for Pet’s, to funny. I will be sure to check this out often. Hi Cara….I have recently begun the trek of moving my family into eating whole foods. I love your website! We also live in Arizona! Trying the honey/cinnamon remedy today. Thanks for sharing. Wow! I just found your website while doing an internet search for grain-free recipes and you popped up! Your recipes sound fantastic and I can’t wait to try them. Your website looks like a great resource. I look forward to learning a lot from you. We have been investigating the GAPS and grain free diet by eating whole foods. Looking forward to learning more about eating this way from your website. I’m attempting to start the GAPS diet but find I react negatively, it seems, to the broth. By that I mean that 15 – 20 minutes following a cup of meat broth, I feel discomfort. My first attempt at the GAPS diet was to experiment with chicken broth that I simmered for 10 – 12 hours. At first it was just fine, great even, but after a couple of weeks, I started to react to it, my lower stomach became swollen/distended for a few days Then I read that GAPS actually begins with meat broth in the first phase, and that bone broth comes later. I also heard that the longer you cook the bones, you pull glutamates from the bones which some people can’t handle in phase one, thus the reason for the shorter cooking time for meat broth. So I made meat broth with pastured beef bones, only cooking them three hours, removed bones immediately, and I’m getting a bloated feeling with it. I can’t find any reference to others experiencing this. Perhaps you have heard of this? Any help greatly appreciated! Traci, I am experiencing this too. What ended up happening… Did you ever find any answers? Look into SIBO, bone broth feeds the bacteria in the small intestine, which meat broth doesn’t. SIBOinfo.com educate me on SIBO. Cara, I am so thankful to have found your blog again! There are so many. I too have a child with Autism. He will be 12 in a few days. We have been on the food/health journey for about 6 years now. I remember you lived in Montana. Now I see Arizona and California? You weren’t a single parent when you started this blog correct? None of my business. I was just curious. Thank you for all you do on your blog. And I wish you all the best being a single Mom. I was raised by a single Mom, so I know how tough it can be, let alone when you have a child with Autism. Many blessings~ Hope in Spokane. Dear Cara, I am so facinated to realize there is a name over the diet I have been following for one and half year. I was diagnosed with ankylosing spondyliities (mild form) in spring 2012 and I started my investigation. I found clues pointing to polysaccharades as being responsible for that syndrome and I could instantly related to that because even I consumed it a lot I knew it was a kracker for my and my gut, but I had never done anything about it. Almost instantly I found a relief (but I started as you call full-GAPS diet) and half year after I started my psoriasis (on front of my legs) disappeard (that was at wintertime here in Iceland, where the sun hardly get any change to shine… at least not for a long time :) ). I am still getting strong, I have tried to take P-saccaharades in again but my body acne instantly in so many was if I do. Your recipies are veru good and they gives my ideas :) thank you! I am so thankful I found your site! You have a lot of great/ helpful info here. Good for you for being so passionate about your childrens health and wellbeing…you can see you’ve done a lot of research. I am a registered nutritionist and I am using your site as one of my resources :) I believe God gives us just what we need to build a healthy family and I enjoy reading all the info you have here. thanks! Hello! I bought your eBook and never got around to downloading it, then when I finally was going to the link on my receipt link said it had expired! Please resend me the link so I can begin reading your book. Thank you! Hi Denise, can you send me an email? Thanks! Thanks for all your great work. Your books have been an amazing source of guidance, support and inspiration for my Gaps journey. I have been following the program for 14 months now but have not been able to shake my allergy reaction to dairy or more frustratingly honey and too much sweetness (from fruit). I recall you mentioning you had a similar problem with your daughter which was eventually resolved with the help of traditional Chinese medicine? Could you please tell me what this was & perhaps I can find something like it here in Durban, South Africa. Yes! She was having an adrenaline response to the sugars he said, he used acupressure. I’m loving your blog! You’re a fantastic writer Laura. I have a lot of digestive issues and now I have burning mouth syndrome from it. A dr told me to follow the gaps diet. But it is confusing to me. Making the broth then adding the probiotics etc. I just came across your book. Is this what I should buy to help me follow the gaps diet to start healing my gut? Your help would be so much appreciated. Thanks for the information you share. Love to see someone using everyday food. Excited to try the southern biscuit recipe looks delicious! I also believe that God has provided everything we need for healing our bodies in this vast earth he created. I am also a blogger and mom of 4 boys, and I love connecting with like minded individuals. I have not done a lot with gluten free and one of my best friends is suffering and we have been searching for answers so I will be sharing with her. God bless and keep up your great work! You say you use “background in the medical industry”. What does that exactly mean? Nothing big- I was a nurse’s aide for a year, was a medical transcriptionist for a couple years, and have an associate’s in science (the prereq to becoming an RN). Certainly doesn’t give me the qualifications to give medical advice, but I am more familiar with mainstream medicine than other people with no experience in this field. I am so glad I came to your page.Your website is full of helpful and useful resources. You had mentioned that your daughter was on the spectrum and she was on GAPS for 2 years. That suddenly gave me hope. My 21 months boy just got diagnosed with autism. I am now a desperate mom trying to find ways to help my son. I have been doing research almost everyday and driving myself crazy. Can you please give me some advice? Other than being on the GAPS diet, what else did you do that helped her? Probiotics? Fermented vegetable? Coconut Keifer and milk keifer? Will you please advise me so that I can help my precious little boy? How can I contact you? Can you please contact me? Thank you! Thank you for all the useful info! I like your website a lot. Ir is one of my favorite and most visited health blog, i read handy health-related information on every single visit. you are actually spreading happiness among people who are facing lots of medical issues and illness. They can naturally reverse diseases by following information shared by you. A big thanks to you for this great blog. Cara, I’m very tempted to put my daughter on the picky eating diet that you propose. However she is nearly 12 and I’m very nervous that this “diet” might induce some sort of eating disorder for her. She is very restricted in what she eats as it is already and I’m not comfortable making an issue of her poor eating habits for all the above reasons. I feel stuck between a rock and a hard place. Have you any advice for doing this diet with tweenagers where food can be a tricky business? Hi Caitriona, it can be difficult to decide what to do for our kids, isn’t it? I do know that the type of diet that the picky eating solution is can help manage/alleviate obsessive behaviors, so families have had success with using it to treat eating disorders. But as her mom, ultimately you know best and I support whatever you choose. Hi Cara, I bought your 30 days on the GAPS intro diet You mention about digestive enzymes. What brand of digestive enzymes are you all taking. My daughter has the same problem about difficulty digesting fats. Does your 30 day gaps book include supplements and kitchen tools needed for diet? Thanks for so many amazing recipes. They were an absolute life safer when I first started GAPS! I am so grateful for your website! I am going to be starting my toddlers on the gaps intro diet – but have questions about what they can eat. Being that my oldest is a picky eater. Do the veggies have to be boiled? Or can get be well cooked? Hi Elena, you can start with ‘full GAPS’ and then work your way to intro once he’s accepting more foods. My Picky Eating Solution has a free webinar that will help you get to GAPS with a picky eater too :) The intro veggies do have to be well boiled. Hi, Where can I find a recipe for the carrot kraut? Can this be used in stage intro 1?